Non-Toxic Munchkin: All-Clad Stainless Steel Set 69% off TODAY! IT's HUGE- No Excuses; It's Time To Get Rid Of Your Teflon Pans! All-Clad Stainless Steel Set 69% off TODAY! IT's HUGE- No Excuses; It's Time To Get Rid Of Your Teflon Pans! For anyone looking to make a HUGE impact in their family's health, one of the easiest changes to make is switching from using Teflon non-stick cookware to stainless steel or cast iron. The catch? Both tend to be quite expensive. Today, however is your lucky day! 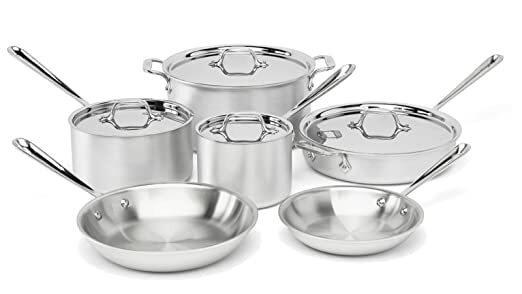 Amazon is offering a ONE DAY 69% disount on a full All Clad stainless steel 10 piece set las part of their Cyber Week Holiday deals. Instead of $1299 you pay $399.99! HUGE. We always keep our eyes open for amazing deals like these that hel you live a healthier less toxic life so feel free to LIKE us on Facebook or sign up to get our weekly posts! When talking about the dangers of Teflon, we are referring to the chemical that gives it its slippery non-stick property;  Perfluorooctanoic acid (PFOA). PFOA is present in trace amounts in up to 98% of Americans. It is not only used in Teflon coated non-stick pans but also in products that claim to be stain and grease proof like furniture, carpet, clothing and food packaging (like Stainmaster fabric protection). In humans it is a classified likely carcinogen. It has been associated with an increased risk of heart disease, heart attacks and stroke. Recent studies have also suggested that prenatal exposure to perfluorinated chemicals may affect the immune system in early childhood. The most extensive study of PFOA's impact on people, the 69,000 - person  C8 Health Project carried out by an independent panel of academic scientists and paid for by DuPont, has found that the chemical decreases levels of reproductive hormones; weakened immune response among other findings. So perfect post. Keep sharing in facebook for all people. Nice. "Santa Wouldn't Put THAT In My Toys"